Yesterday the 2010 Ford Fusion was named the car of the year! No surprise here! 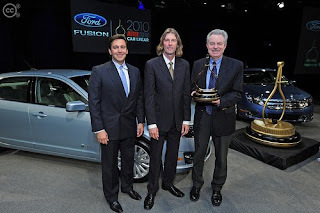 The Ford Fusion – America’s most fuel-efficient midsize sedan – today was named MOTOR TREND’s 2010 Car of the Year®. The award comes hot on the heels of Fusion setting record-breaking sales for 2009. The prestigious award from MOTOR TREND comes at a time when Fusion sales are already at an all-time high, further positioning the vehicle as a formidable contender in the competitive midsize sedan market. To win the coveted Car of the Year award, Fusion outperformed the competition – including the BMW 7 Series and Mercedes-Benz E-Class sedan – in six new categories: design achievement, engineering excellence, intended function, efficiency, safety and value. The 2010 Fusion and Fusion Hybrid are the most fuel-efficient sedans in America. The new models offer more power; class-exclusive technologies, such as Blind Spot Information System (BLIS®) and Ford SYNC®; and more total passenger and luggage capacity than the Toyota Camry. The Fusion lineup expanded in the 2010 model year to include all-new Hybrid and Sport models and a new selection of gas-powered engines – all paired with six-speed transmissions – that deliver even more horsepower and better fuel economy. The Ford Fusion has been generating excitement among journalists and consumers alike since the nameplate first launched in the fall of 2005. In fact, the introductory model – which marked Ford’s re-entry into the midsize sedan market – was a finalist for MOTOR TREND’s 2006 Car of the Year award. Since then, Fusion’s popularity has continued to soar – and so have sales. Fusion set a sales record in April – the first full month of sales for the redesigned 2010 model and the new Fusion Hybrid – and overall sales are already at an all-time high for 2009. With its quality unsurpassed by Toyota or Honda, best-in-class fuel economy, class-exclusive technologies and significant residual value improvement, the 2010 Ford Fusion is clearly delivering the key attributes that midsize sedan buyers want. The new Fusion Hybrid model has played an important role in Fusion’s success. The vehicle delivers an EPA estimated 41 mpg rating in the city and 36 mpg on the highway, topping the Toyota Camry hybrid by 8 mpg in the city and 2 mpg on the highway. It also offers innovative new technology – SmartGauge™ with EcoGuide – that coaches hybrid drivers to maximize fuel efficiency.